If you want to give your customers a discount or attract visitors with a special promotion you can use a coupon code for this. 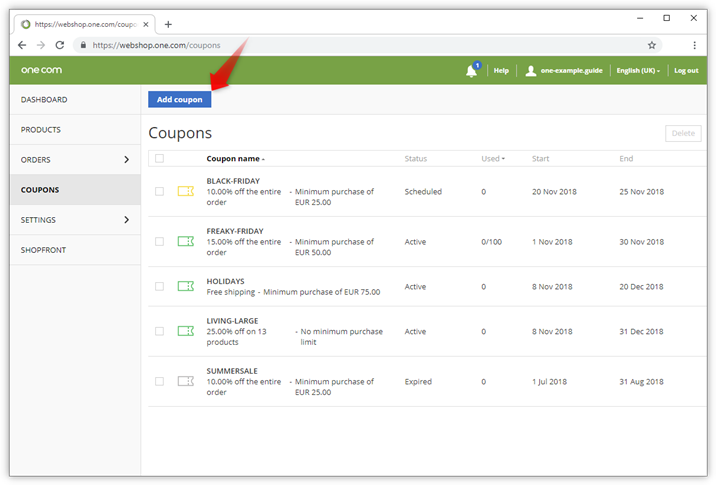 You can create the coupon from the Online Shop Dashboard. Customers who have such a code can enter it during checkout to get free shipping or a discount on their purchase. 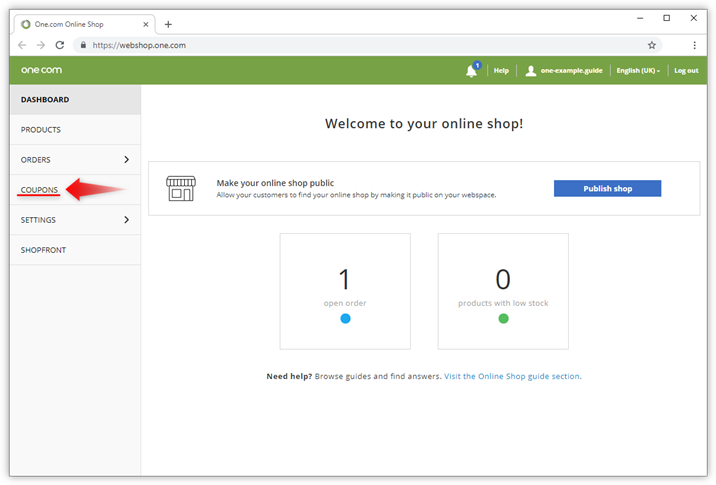 Log into the One.com control panel and click on the Online Shop tile to open your shop dashboard. Click Coupons in the menu that is located to the left of your screen. Here you can see an overview of all coupons that have been created. 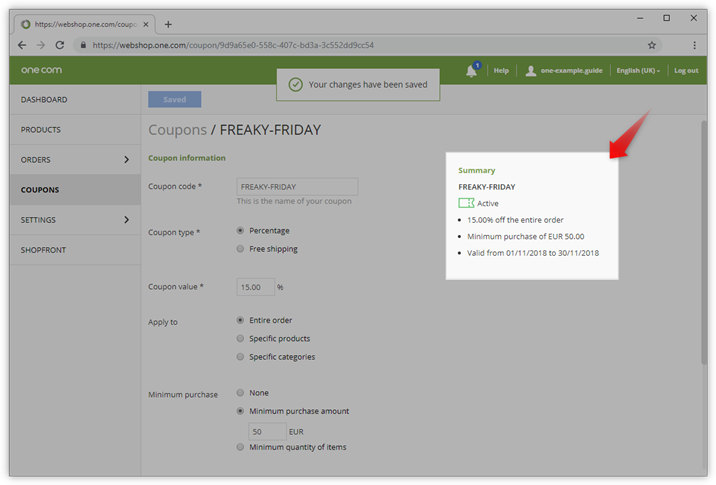 A grey icon indicates that the coupon has expired, green means it's active and yellow means that it is scheduled for a future date. Click on the button Add coupon to create a new coupon. Tip: You can also edit an existing coupon, for example, if you want to reactivate it. 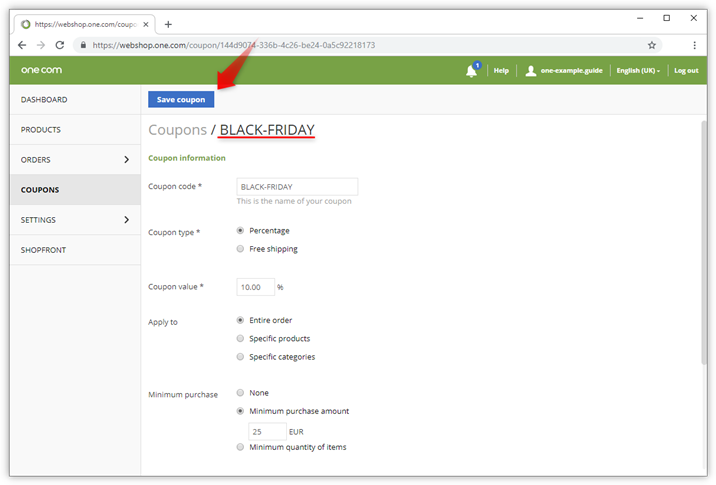 To permanently delete a coupon, check the box to select it and click delete in the top right corner. Coupon code - this is the name of your coupon and also the code that your customers need to enter to redeem it. Spaces are not allowed. Coupon type - Choose if the code should offer free shipping or a percentage in discount. Shipping destination - If you have selected free shipping, you can specify if the discount is valid for all countries that you ship to, or if it is only valid for specific regions and countries. Coupon value - If you have selected percentage, you need to enter the how much discount the code should give. You should also choose if the discount applies to the entire order, specific products or specific categories. Minimum purchase - You can select a minimum amount that the customer needs to spend in order to use the coupon, or a minimum number of items. Usage limit - you can limit the number of times that the coupon code can be used in total. This is not restricted to a customer, meaning one customer can use the code several times. 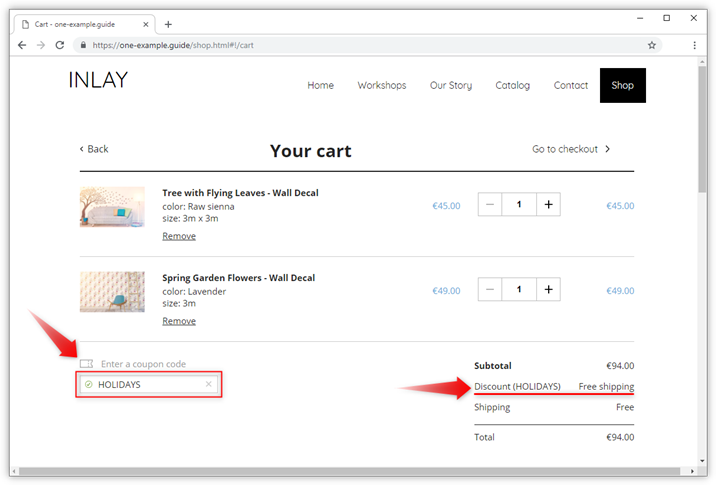 Valid from - Here you can set the date from when the code is valid, for example, if you want to start a sale after the Holiday season. You can also specify an end date, from when the code is no longer valid. If you don't set an end date, it is valid indefinitely or until the usage limit has been reached. Click Save coupon when you are done! After you have saved your coupon, you can see a summary of the coupon you created. Check if everything is as you want it. Customers can now use the coupon code in your online shop. When you go to the cart, there is an option to enter the code. If the coupon is valid, this will be visible right away in the payment overview.